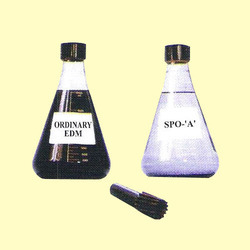 Prominent & Leading Wholesale Supplier from Mumbai, we offer dnr spark spo-a edm oil and edm oil. We are supplying, trading and subdealing in DNR Spark SPO, a Long Life EDM Spark Erosion Oil that is highly acclaimed for its low viscosity. It is specifically developed for long functional life and is used extensively for flushing, finishing and shining operations. It allows rapid carbon settling and does not cause itching. We follow stringent norms of quality and offer this at industry leading prices to our patrons. Backed by sound industry knowledge of Manufacturing and supplying in large array of EDM Oils, we are presenting EDM Oil Sparkling Oil Die Electric Fluid to our valued customers. It is commonly used in general-purpose mold and dies applications requiring optimum rates of metal removal, proper flushing and close tolerances. It is acclaimed for being low in viscosity for excellent cooling of electrode as well as work-piece. It can be availed very reasonable rates. Looking for Synthetic Technology Edm oil ?